Recent studies into the effects of TV on children have highlighted some major problems with the viewing habits of our children. This page looks at each of these issues in turn. A study done by the American Academy of Pediatrics (AAP) found a link between high levels of TV viewing in young children and a later diagnosis of ADHD. Doctors believe that watching TV in the crucial early years when a child's brain is developing may actually cause the brain to be wired to respond more to the TV environment than the natural environment. Another study done in New Zealand showed similar results. It found that attention problems in adolescence were directly related to the amount of TV the teens had watched as children. For this reason, doctors are now recommending that babies under the age of two do not watch TV at all. A Canadian study published in 2010 also found that watching TV negatively affects development. The lead author of the study said that pre-school is a critical time for brain development and that watching TV displaced time that could be spent engaging in ‘developmentally enriching tasks’. This is really the biggest problem with children and TV - the problem of what children are not doing while they're sitting in front of the screen. Think of the things young children like to do. As well as being fun, these activities are all helping to develop their eye-hand co-ordination, manual dexterity, cognitive abilities, communication skills, imagination, social skills and gross motor skills. 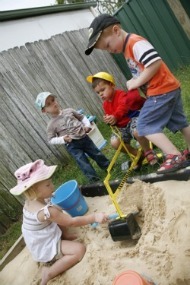 Young children who watch a lot of TV miss out on all the fun and on the developmental benefits these activities bring. Older children also miss out when they watch a lot of television. 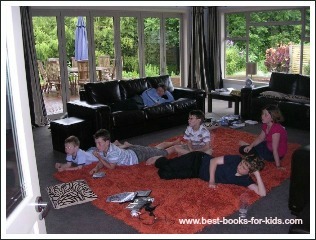 Think of all the things they're not doing while they’re sitting passively in front of the TV. ... and the big one - reading! Again, these activities are all very important for children. They’re important for their physical health, for the development of their social skills, for their self-esteem and for their cognitive development.